Our latest event on the future of Europe post-2019 featured a brilliant intervention by Prof. Simon Hix (Professor of Political Science at the London School of Economics and Co-Founder of VoteWatch Europe), who provided valuable insights on what might happen next year. 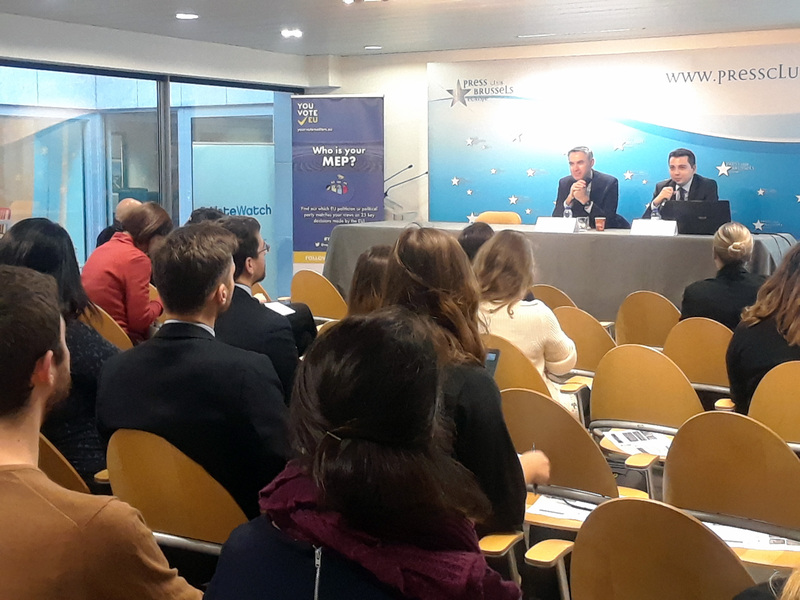 Additionally, Doru Frantescu (Director and Co-Founder of VoteWatch Europe) provided key updates on the policy forecasts that VoteWatch Europe is carrying out in the run-up to the European elections. The current opinion polls show that, despite the heavy losses, the EPP and S&D are set to remain the two largest groups in the European Parliament after next year’s elections. However, Prof. Hix pointed out that both large parties and parties in government tend to fare worse in European elections than polls predict. According to data from previous elections, Social Democratic parties tend to under-perform in European elections even when they are in opposition. Conversely, both far-right and Green parties tend to over-perform in European elections, which increases the likelihood of a highly fragmented European Parliament in 2019. According to Prof. Hix, the ultimate success of the Spitzenkandidaten process will hinge more on the level of attention that national media will pay to it, rather than the number of groups that will put forward a leading candidate. As the purpose of the process is to link the European elections with what happens in Brussels, the process is of little use if national media do not cover it. The European Council will find it more difficult to ignore the Sptizenkandidaten process if this gets traction during the electoral campaign. For instance, the awareness of the Spitzenkandidaten process among Germans in 2014 also contributed to Angela Merkel’s decision to support Juncker, despite her initial scepticism. Concerns over Weber’s lack of experience might be exaggerated, as the Bavarian leading candidate for the EPP will have a chance to prove his value during the electoral campaign. According to Simon Hix, the German government is unlikely to abandon Weber after the elections, while the concerns over his nationality might be also overrated, as his German passport did not prevent a large majority of EPP delegates to support him. However, Southern left-leaning governments are likely to be a thorn in his side. Progressive forces in the European Parliament are also likely to generate headaches for Manfred Weber, as his strong conservative credentials might spur the establishment of an anti-Weber coalition in the European Parliament (ALDE, S&D and Greens/EFA). According to Doru Frantescu (CEO & Co-Founder of VoteWatch Europe), the policy impact of the EU elections in 2019 will vary across different policy areas. VoteWatch regularly provides forecasts on the future direction and speed of EU policies (for more information, check out our previous forecast on EU data protection, trade and digital IPRs policies). VoteWatch Europe also looked into specific policy issues. We discovered that, even though a majority of MEPs within the next European Parliament are expected to remain supportive of free-trade agreements, the level of support for the introduction of ISDS clauses (or similar mechanisms) is likely to decrease, due to the concerns of the rising right-wing forces over national sovereignty. Mr. Frantescu also provided key insights into transportation policy, showing how the level of support among MEPs for railway liberalization is set to decrease after the elections next year. Feel free to contact us to discover our projections in other policy areas, such as migration, foreign policy, etc. According to Prof. Hix’s predictions, May will ultimately be able to push a Brexit deal through the House of Commons, meaning that the UK will manage to leave the EU on the 29th March 2019. The political declaration will help in this regard, as the blueprint for the future EU-UK relations is vague enough to be accepted by different political factions. However, the future shape of EU-UK trade relationship will depend on May’s successor at the helm of the British Conservative Party: while ending the freedom of movement was set as the ultimate red line by Theresa May, other Tory leaders might have different priorities.